It's a good time to see autumn leaves in Tokyo now. I went to see the leaves on the ginkgo trees along Gaien-dori. The leaves already turned yellow. The autumn leaves festival hold from the middle of November to the beginning of December. It was fine and very warm yesterday. Many people came to see the beautiful autumn leaves. The leaves of ginkgo were bathed in a golden light. It was almost the leaves carpet. 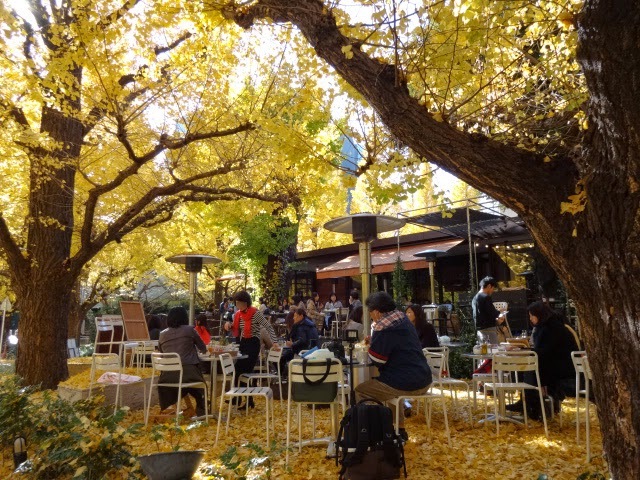 People were enjoying seeing the yellow leaves at the cafe. Two chihuahuas posed like a model with the yellow leaves in the background. It's good time to visit to Japan in Spring to see the cherry blossoms. But also November is the good month to visit to Japan. The weather is stable, the autumn food is delicious and you can see the beautiful autumn leaves.